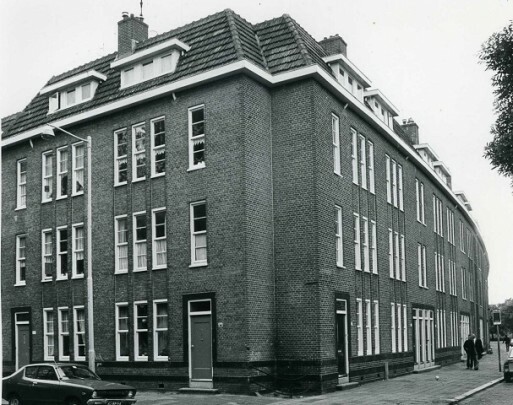 Oud's first housing blocks as Rotterdam City Architect were not entirely his design, the walls on the Bilderdijkstraat being by Meischke and Schmidt. The alignment of eaves gutters and a continuous plinth preserve a unity within the blocks. Each consists of apartments on the two lower levels with maisonettes above. All units have front doors on the street. Theo van Doesburg gave advise on the interior colour schemes and designed the leaded windows above the doors. The blocks took quite a battering during the recent urban renewal operations in this area. Of blocks I and V only the continuous plinth recalls the original architecture; the roofs have even been levelled off in the part designed by Oud. The stained glass windows by Van Doesburg were even thrown away.